Generations of good, brave people fought to kick racism out of British society. If anyone had looked at the 'Isles of Wonder' we showcased to the world on the 27th July 2012 they'd have believed our war had been won as that day, just four years' ago, was the day this London Olympic opening ceremony put in lump in our throats and made our chests burst with pride. But racist incidents are on the increase. A small number of people unfortunately feel they have been given permission by recent events to let their inner ignorance speak out. Last week Hammersmith's Polish Center was daubed with racist graffiti and there has been a 500% increase in the number of reported hate crimes. In recent weeks too many of our friends and neighbours have been confronted by racist and xenophobic incidents: people asked why they're still here; told to go home; told we voted for you to leave and worse. That's just not the country we are and it certainly is not the country we are going to become. 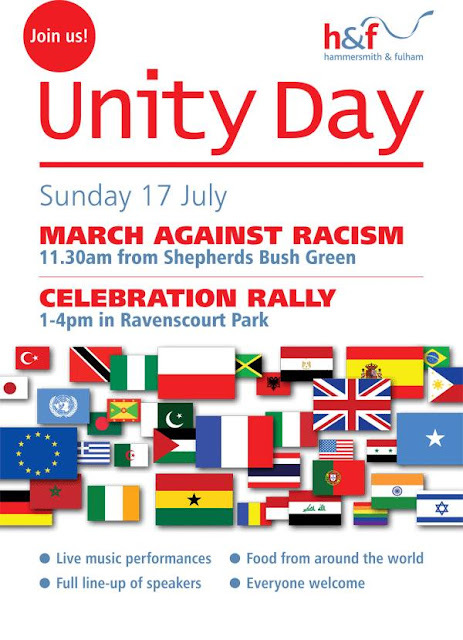 On Sunday, 17th July the vast majority of us will have a chance to stand up and state that we are proud of all the good people that have made their home in Hammersmith and Fulham: those who came from the other 27 EU countries, and those from everywhere else in the world. H&F's Unity Day will begin with a chance for us to walk together against racism and xenophobia. It will finish with a festival of celebration of the many cultures that make our London borough one of the most wonderful places to live anywhere in the world. Please come and please tell your friends and neighbours.